A team of innovative City University London alumni is among the winners at the 2015 Santander Universities Entrepreneurship Award. Luca Amaduzzi, Agostino Stilli and Simon Bardick set up the company Cycl while studying for the Masters in Innovation Creativity and Leadership (MICL)at City. Along with four other teams, they were shortlisted for the postgraduate award and invited to present their idea at the finals held on Thursday 2nd July. The team were awarded second place, winning the £10,000 prize and a place on the Santander Universities Community Programme. The Cycl team’s innovative bicycle indicator product WingLights allows cyclists to increase the visibility of their turning signals in order to improve the safety of riding on the road. 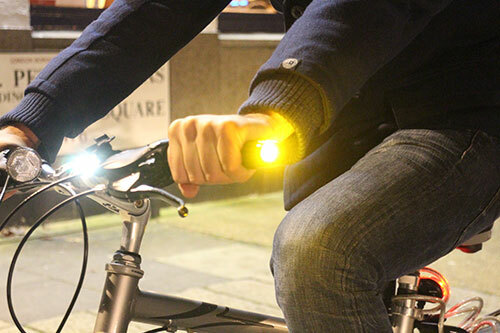 WingLights magnetically attach to the ends of handlebars and flash amber at the same frequency as a car’s indicators when tapped. Following a successful Kickstarter campaign, they have taken more than 1,000 pre-orders and have garnered interest from several major retailers. “We were extremely happy to make it to the finals and even happier when they told us we had taken second place and won £10,000. The fact that the competition was arranged by Santander made it even more important as they are now the sponsor of London's bike sharing scheme. The money we won will definitely go into research and development so that we can soon release other products." The awards, now in their fifth year, are funded by the Santander Universities Division and aim to support and encourage university students to pursue their business ideas. Alongside the £44,000 prize fund, the top three students in both the undergraduate and postgraduate categories have won entry to The Santander Universities Community Programme. This programme provides networking opportunities and business advice to help further develop students’ business ideas. It has been great to watch this team progress and they have earned every bit of their success. The Cycl team is very hardworking and dedicated to make their idea come to life. It is exciting times for our entrepreneurial students and graduates and we are thrilled to see so many interesting startups growing out of City. The Hangout is City's student enterprise incubator, where students and recent alumni get support to test and launch their business ideas. Based at the headquarters of video ad tech company Unruly, the Hangout provides a place for student entrepreneurs to hot-desk and network with people from across the Tech City community.